MOBILE PHONE CAMERAS ARE GETTING BETTER, MAKING LIFE EASIER FOR THE DIGITAL GENERATION. Since the advent of mobile phones, communication has been made easier, more effective and of course, more efficient than before. As time went on, the mobile phone phenomenon began to evolve with the speed of the digital age, and as people's minds were evolving, so were the gadgets and appliances. Internet became more accessible, phones became slimmer and sleeker, their capacity to handle tasks increased, battery life improved and of course the quality of their in built cameras became a whole lot better, and in some cases, almost mind blowing. More people own phones that have cameras of up to and more than 12 megapixels, which is practically more than what some entry level DSLR cameras have. Speaking of DSLR cameras, does this evolution of the mobile phone camera really knock them off the shelf? Well, not exactly. You see, as good as phone cameras are, there are certain features a DSLR camera has that phone cameras don't although, there are lot of features they do have. Think about this - if you're going to pay a photographer a large amount of money to take your pictures, then you certainly would not be impressed should he show up with a mobile phone, no matter how superior the camera accessories and attachments it comes with. Now, that's exactly why these mobile camera phones are appealing greatly to the ones who don't need extreme professional cameras e.g, bloggers. Companies like Apple, Samsung, Huawei, Nokia, Infinix, HTC, Nokia and many more are creating phones with highly impressive cameras although the two leading and competing brands are Samsung and Apple. The Samsung S6, S7 and S7 edge, IPhone 6, 6plus, 6s and 7 are the top leading devices when it comes to fantastic camera quality but what does this mean for all of us? Apart from being able to take amazing pictures of ourselves, beautiful selfies and clear "outfit of the day" pictures, it also greatly helps brands in the aspect of taking pictures of interesting and immediate happenings for social media deployment and helps brands provide their viewers with real time occurrences. We all know how much we'd rather watch a video or view a post with clear picture quality. This also helps bloggers, media specialists and even fashion based platforms produce and execute quality content. Now, the slight down side to this is of course the price, these phones range from prices of about 150,000 to 250,000 Naira which is approximately 350-650 Dollars. It's quite expensive right? But you know what they say..... Quality doesn't come cheap. But wait, you don't need to have that amount of money to promote your brand. How you might ask? This is because companies like Samsung, infinix and Huawei partners with social media, entertainment and fashion influencers by giving them these phones for free and in return, these brands show their viewers and followers all the amazing things the gadgets can do, basically bringing quality closer to the people. 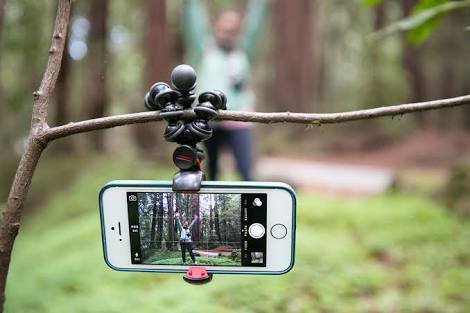 These phone cameras are not only good for individuals and brands but also greatly help sports activists like hikers and cyclists , travel journalists and even undercover journalists. It allows people to have quality at their finger tips. Take for example, most art galleries restrict people with professional cameras from taking pictures of the art but with your 12 megapixel smart phone, you can capture every beautiful moment and every stunning art work. Over the years we have evolved and like it was mentioned above, the mobile phone companies have evolved with us making it easier for our brands to grow and for us to have a seamless flow of communication and more importantly, quality of information and with features like being waterproof, light weight and sleek, they're allowing us to rethink what a phone can do. The truth is, as creatures of sight, we are attracted to the aesthetics in colourful, bright and clear pictures and with the invention of high quality phone cameras and even camera extensions and and accessories, the world has been made a brighter place. So, take this advantage to make your brand better, utilize the resources you have and you'd be surprised by the outcome.